As always, it all starts with a good design. I can be a hacker. Sometimes I am. But for projects I love most, the perfectionist in me insists on starting with a good design. I actually did some drafting work initially using plain ol’ rulers, triangles, pencil, pen and paper. I still have some blue prints somewhere. Yet, there’s always this itch to design using modern tools: 3D Solid Modeling! It makes perfect sense! Technically, this is not a solid-body guitar. The cavity essentially makes this an acoustic-electric guitar. The objective is to control and actually take advantage of the inherent body resonance. 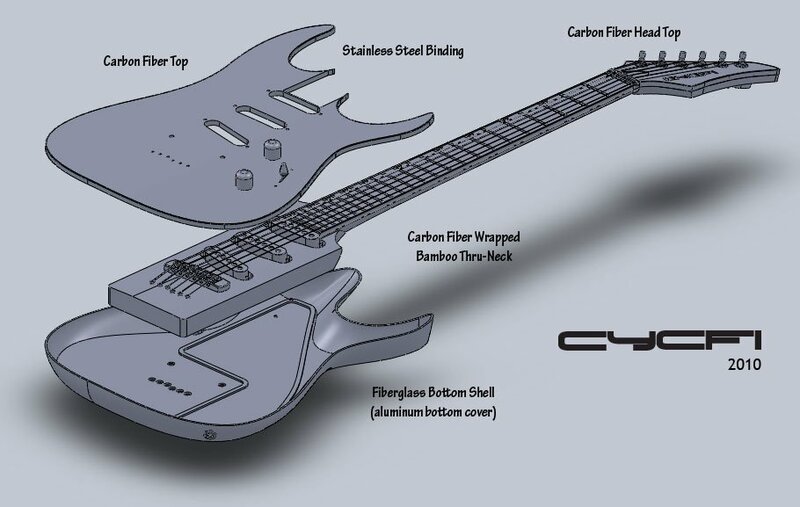 This guitar will be designed with feedback in mind, especially for low sound level/volume, studio use. I love singing and weeping guitars that sustain indefinitely with controlled feedback. This usually means cranking the volume up to 11: the hallmark of Hendrix et al. I love this effect, but I love my ears too and so I wish to achieve this effect at much lower volume levels. The central thru-neck piece is a single piece, solid, select bamboo – epoxy laminate, wrapped in carbon fiber for added rigidity. The truss rod is adjustable and likewise made from carbon fiber. The body and head tops are made from 4 layer carbon fiber/epoxy laminate with 0.5 mm stainless steel binding.